Turn your GT2 red! Includes red chassis,top plate,center diff plate,steering rack,shock caps and spring adjusters,arm mounts,radio tray, and wheel hexes an.. Turn your GT2 red! 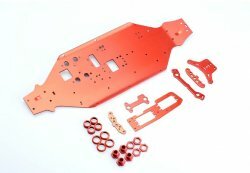 Includes red chassis,top plate,center diff plate,steering rack,shock caps and spring adjusters,arm mounts,radio tray, and wheel hexes and nuts. Simply enter your details below and we will send you an e-mail when “IGW050R Inferno GT2 Conversion Kit RED” is back in stock!